A popular, long standing Christmas decoration is in risk of getting taken down after a civil rights group opposes it standing on top of a public elementary school. “It’s just a symbol of our community it’s always been there and we love it,” says Amy Postma. 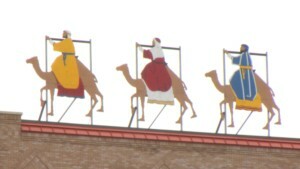 For decades the Three Wisemen have watched over Newaygo from high on top of the elementary school. Three wisemen heading towards the star of Bethlehem. A tradition for Newaygo, but possibly an illegal tradition, a failure to separate church and state. People around town have been talking about the controversy over the weekend and very few want to have the decorations taken down. The MACRA have done similar work in other Northern Michigan town, making sure religious paraphernalia is kept off public land. Whether it has community support or not. “The constitution of the United States is not a document that is concerned with the majority opinion,” says Kahle. The school district plans to have an official response by the end of the week, whether they take it down, move it to private land, or continue the fight to keep them up and possibly head to court.